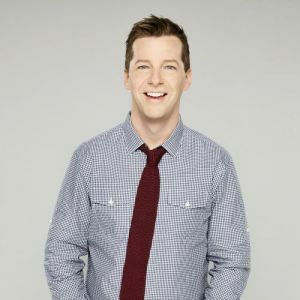 Sean Hayes returned to his iconic role as Jack McFarland on NBC’s Will & Grace, which was revived on the network in 2017, returning to critical and commercial success. Hayes was raised in the Chicago suburb of Glen Ellyn, Ill. A talented musician, he supported himself as a classical pianist and performed in a pop band while attending Illinois State University, where he majored in performance and conducting. After his college experience, Hayes began working in the Chicago stage community, serving as the music director at the Pheasant Run Theater for a few years where he appeared in several of their productions. After moving to Los Angeles, Hayes had gigs as a standup comic, performing at the Comedy Club, and starred in the television movie A&P, based on the short story by John Updike. In 1998, Hayes received his big break and landed the role of Jack on Will & Grace, for which he won an Emmy Award (and was nominated six times), four Screen Actors Guild Awards, two TV Guide Awards, an American Comedy Award and seven Golden Globe nominations. Hayes also won an Emmy Award for his acclaimed hosting duties of the 2010 Tony Awards. Hayes’ other notable television projects include well-received guest roles on Scrubs and 30 Rock, as well as Martin & Lewis, a television film that earned him a Screen Actors Guild Award nomination for his role as Jerry Lewis. Hayes appeared in multiple episodes of the NBC sitcom Up All Night, in which he played a former colleague of Ava’s (Maya Rudolph). He also made guest appearances in recent seasons of Parks and Recreation, Portlandia and Hot in Cleveland. In addition, he had an arc on Smash as a TV and film star making his Broadway debut. Last year Hayes had a role in NBC’s Hairspray Live!, which was nominated for seven Emmy Awards. Hayes made his Broadway debut in 2010 in the wildly successful Promises, Promises, alongside Kristin Chenoweth. Based on Billy Wilder’s Academy Award-winning film The Apartment, starring Jack Lemmon and Shirley MacLaine, the play starred Hayes as Chuck Baxter, a young insurance employee who lends his apartment to his executives for their illicit affairs as a means for advancement within the company. In 2016 Hayes returned to Broadway as the title role in An Act of God, for which he received glowing reviews. Previously, Hayes was seen on stage in the New York City Center production of Damn Yankees, with Jane Krakowski and Cheyenne Jackson. In addition to receiving a Tony Award nomination for his role in Promises, Promises, he also hosted the Tonys in 2011 to strong reviews. Hayes starred as Larry Fine in the movie The Three Stooges, directed by Peter and Bobby Farrelly, and is a voice actor in this summer’s box office hit Monsters University. Hayes’ additional film credits include The Bucket List, opposite Jack Nicholson and Morgan Freeman, Billy’s Hollywood Screen Kiss, Pieces of April, the voice of Mr. Fish in The Cat in the Hat, Win a Date with Tad Hamilton, Igor, Soul Men and the voice of Mr. Tinkles in the box-office hit Cats and Dogs. In 2003, Hayes and producing partner Todd Milliner formed Hazy Mills Productions. Their first project, Situation: Comedy, a documentary television show in search of the next great sitcom, premiered on Bravo in 2005 and garnered wide critical praise. For six seasons, Hazy Mills previously produced TV Land’s hit comedy Hot in Cleveland, starring Betty White, Wendie Malick, Jane Leeves and Valerie Bertinelli. Hazy Mills produced NBC’s long-running drama Grimm, a dark yet fantastical cop drama that took place in a world where Grimm’s Fairy Tale inspired characters exist, and is currently producing the network’s successful reality series Hollywood Game Night. Additionally, Hazy Mills produced the eight-part docuseries The History of Comedy that aired on CNN in 2017 and Season 2 coming summer 2018.